Is your company doing what it takes to be the best in your industry? Are your products and services positioned optimally in the marketplace? How often are your customers delighted with your products/services? Do your mission statement and business leadership inspire optimal performance? Does your organizational culture fully support your mission and vision? You can rise above traditional management consulting, to consistently optimize — instead of just manage or improve — your management and business challenges. Using Optimal Thinking, we collaborate with you to consistently optimize strategic analyses, business plans, innovation, and execution. Keep in mind, thoughts are the parents of business initiatives and performance, and management can be a mere step above incompetence..
Optimal Thinking is the mental software for management optimization. Every time an executive thinks suboptimally, efficiency, effectiveness and profitability are reduced. 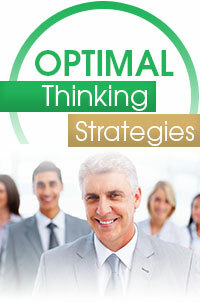 We assess individual, team, and departmental strategic thinking levels in your organization with our unique, proprietary Optimal Thinking 360 Online Assessment (for desktops and tablets) to provide information that enables optimization to have the greatest impact. Experience your business optimization consulting onsite, at our offices in Marina del Rey, Los Angeles (map), by telephone, or video conference.